This past summer, my friend Elaine Weeks (Managing Editor of the Walkerville Times) and I were running along the riverfront path that links Walkerville to my old neighbourhood. Left once again in Elaine's wake I took a 'breather' by the railroad bridge, at the foot of Caron Avenue. While admiring the brickwork, I noticed the eastern portion of the bridge contained a convex arc which appeared to be the foundation of a building. I could also see a bricked up door and window. When Elaine returned, we decided it must be what's left of the old CPR station. But what happened to it, we wondered? As "The Westender" I knew I had to find out the whole story. I thought this would be a pretty "cut and dried" tale. Not so. I was disappointed by the lack of information available in our local public archives and the history section of the Windsor Public Library. I called local rail and bus historian Bernie Drouillard hoping he would know something about this buildingò to no avail. A call to the archives at Canadian Pacific Railway in Montreal revealed only that it was built in 1890. As Windsor was an integral link to the United States and all points east, it would make sense that ours would be one of the first stations built. CPR built 70 stations between 1886 and 1896. Following this early phase, an eighteen year construction blitz lead to more than 700 stations being built or replaced on their lines. The bulk of these stations were similar in style to the ones that existed in the town of Walkerville and downtown Windsor. Most kept architectural embellishments to a minimum. Our CPR station was unique in that it featured a turret (only one other similar station was built in Smithville, Ontario). Windsor Salt commenced business in 1892 and housed their first offices in the tower of the CPR station, though their main business site was on the south side of Sandwich (now Riverside Drive). A major salt deposit was discovered right below where CBC Place now sits, on Riverside Drive West at Crawford. The only evidence today of this is that on occasion, sink holes have been known to appear in CBC's front lawnò hence the wrought iron fence erected last year, for insurance purposes. 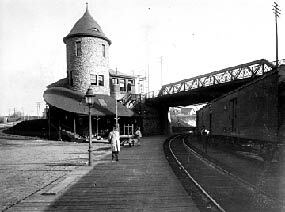 The CPR station was abandoned in the 1920's when a new one was built at the foot of Pelletier Street to accommodate train passengers coming through the (now electrically lit) train tunnel from the U.S.
Evidently, Windsor's turreted station was demolished some time during the 1930's. All that remains is a small portion of its foundation and two photographs. Its brief existence has not been well documentedò another example of a piece of our history gone in the blink of an eye.